Hitting Today and How Much Is Too Much? I’ve been entirely too “hit and miss, mostly miss” about blogging since Mr. Iknead and I returned from our vacation. I’ve intended to get back in the routine, but have found some sort of excuse every day to put it off another few minutes, which turns into hours, which turn into days…. I think this is one reason I’ve been so lazy about posting – too many projects with most of them stalled for one reason or another. The Ruffled Tank is ready to block before starting the ruffles, I intend to get that accomplished today and I started the Botanical Cowl on Friday, using the last vacation souvenir yarn from the Destin Yarn Shop. 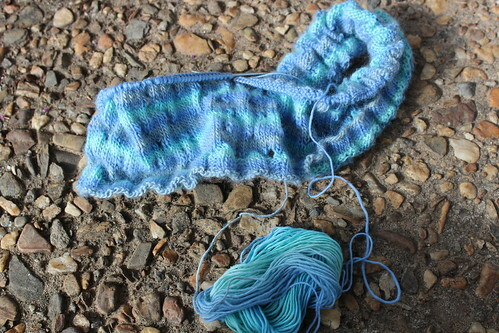 Then there’s the Blue Day socks I want to cast on for the Blue Day KAL on Ravelry, which started last week. I love the idea of a KAL, but the committment? Not so much. I should go get dressed so I can get some pics of the abovementioned before it gets too hot. Doing it in my pjs doesn’t bother me a bit, but Mr. Iknead tends to freak a little when I go outdoors in my jammies for anything other than picking up the newspaper from the front door. My neighbors across the back probably aren’t nuts about it either, come to think of it. Then there’s the attempt at destashing, asking myself to answer truthfully, “Are you really going to use this yarn/yarn remnant someday?” Sigh. Where do I draw the line? Sigh. I’m falling in love with Mini Mochi, I think! 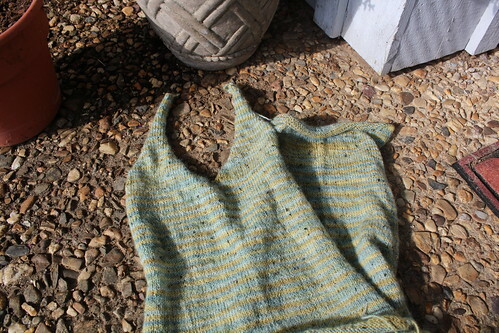 Ruffle Tank before washing, blocking and ruffles. And then there’s the spinning. I’ve spun nearly all the fleece from last week, I’ve been holding a little back, sort of like for a rainy day, which I plan to card and spin sometime this week, if not today. I ordered some beautiful roving last week and am a little bummed that it hasn’t arrived yet and with today being a holiday, it for sure won’t arrive until tomorrow at the soonest. This is where the rainy day thing kicks in.